Vicki Batman has sold many romantic comedy works to magazines, several publishers, and most recently, two humorous romantic mysteries. Along the way, her writing has picked up some awards and bestsellers. An avid Jazzerciser. Handbag lover. Mahjong player. Yoga practitioner. Movie fan. Book devourer. Chocoaholic. Best Mom ever. And adores Handsome Hubby. Most days begin with her hands set to the keyboard and thinking "What if??" When Handsome and I travel to Colorado, we pass through Texas. I am always intrigued by names of restaurants, towns, and roads we see. Many years ago, one caught my eye-Wagonsellers Road. I searched for any information about Wagonsellers Road and found nothing except for a terrain map. I did find a person who lives near Wagonsellers Road with the same last name. So I’m thinking this person is related. I can fully imagine a family built covered wagons and sold them to people headed west: wagon + seller = Wagonseller. Or maybe the family lived elsewhere, adopted the name, and settled in Texas. I don’t know for sure. Just my writer’s imagination taking me places. I did send an email to the nearby city to ask. We also see abandoned homes. The weeds have grown high. Holes in the roof. Windows are trashed. The wood siding has turned shades of gray and is warped. Acres of farm land surrounds them. Sometimes, there is a tree or two, which looks equally worn out. Every time we pass these houses, we say, “Sad house.” They do look sad. And again, my writer’s imagination takes me to what happened to the families who built the homes. Handsome says the houses might be from the Depression who left the area to go west and discover something better for their lives. As we roll closer to the Panhandle, we think it possible the houses were abandoned during the great dust storms. Most of my stories take place in the fictional town of Sommerville. In a quick Google search, I found towns with this name in Massachusetts, New Jersey, Texas, and many people with the same last name. I knew I hadn’t created a new town, but I had hope it sounded like a decent, stable city. And in that town are many kinds of businesses: Dee’s Delicious Donuts, SuperSaver Grocery, Mama and Papa’s Italian Restaurant. A lot of those are patterned after places I frequent in my hometown. “I love going there. Maybe silent flicks are showing.” A magnetic energy drew me toward him. My palms smoothed down my jean-clad legs. I wriggled my ragged sweatshirt sleeves into place. I should have dressed nicer. I confess-I love the indie theater in my hometown. Many a time I’ve sat in the café before a movie in the main theater began and watched cartoons or black and white shorts, some from the silent era. Such a treat! Do you know where the name of your hometown came from? Sommerville is the hometown in The Great Fruitcake Bake-off, a romantic comedy holiday story in the Whispers of Winter anthology. When five-time champion Samantha Greene teams up with her new neighbor, Dixon Roberts, for The Great Fruitcake Bake-off, they discover baking a prize-winning entry is complicated, bad guys are plotting to take the crown, and first prize isn’t just about a ribbon. As a kid, my family went on vacations. I remember swimming in the Gulf of Mexico and picking up sea shells, especially sand dollars. One year, we drove to Louisiana and dropped off my grandmother at her brother’s for a visit. We continued on to Alabama where we visited the USS Alabama, a WW2 battleship my dad served on. We moved on the Pensacola and played in the white sand. Another year, we packed for two weeks and drove to California, stopping in New Mexico and Fresno, California so Dad could visit relatives. We went to the Grand Canyon and the Petrified Forest, saw the cousin’s vineyard, took a trip to Disneyland!, and drove up Highway One to San Francisco. Handsome and have taken the boys to visit family, and on cruises to Hawaii, Alaska with a stop in Vancouver, Sea World in San Antonio, and not long ago, a Rhine River cruise. Frequently, we visit Colorado. Since I’ve begun writing, when I travel, I journal about where I am, what I did, and how I felt. All of this makes good material for my writing. For example, when Handsome and I went to the Broadmoor in Colorado Springs for our anniversary, I spied an event sign and my brain when hello???!!! That inspiration and something someone said ignited, propelled me to write Man Theory. Here’s a fun excerpt. For work, we’d traveled to Colorado Springs to attend a workshop on web design innovations. After check-in, I’d joined him at the bridge crossing lake to decide about lunch before the meetings commenced. Can you spot in the excerpt what I saw one day? I began my writing career with my first humorous romantic mystery, Temporarily Employed. I wrote and wrote on it, adding and editing over several weeks before I told friends and eventually, Handsome. Handsome was floored. I worked on that book for a long time, like maybe three years. We weren’t agreeing any more and the editors and agents were passing on it even though it placed in a writing contest. My friend in my local RWA chapter and I agreed to begin critiquing each other’s work. She kicked off our relationship by introducing me to very short stories. As I read them, a rhythm began in my head and I determined I could write my own story and did! I was obsessed and churned out story after story after story, eventually culminating with thirty-two short stories. Some are little, like 1,000 words. Some reach over 15,000 words. Over the years, I put out three little collections. Now, I’ve combined the little collections plus two new very shorts into a new anthology, Just Desserts. Ouch ~ Who knew a yoga class would be so dangerous…and romantic? This Is Not Working ~ One of those days at a new job when nothing is going right, and then the boss steps in. Other writers have said to me, “I can’t write short.” I just laugh because I have a hard time writing long. I have lots of ideas for short stories and can write them a lot faster than a book. And I love my books! have to do with writing? 1/Finding out what a cover artist has developed for the cover of the book. 2/Delving into edits to uncover what an editor feels the book needs to be fully developed. 3/ And then there’s characters. This may be the most important discovery in my process, especially since I am a pantser writer (writing by the seat of my pants vs. writing with a plotted outline). I am not a trained writer; I am huge reader. I consider myself to be self-taught. When I began my career, I took tons of classes and scribbled everything in my head to the page. When I reached The End, my work really began because those guts I spilled are so not perfect. I’ve got to revise and revise and revise. my head and something magical happens. I discover the perfect word, the best description, a new phrase, a plot line needing a bit more finessing. I discover more about my book. I’ve had moments when driving and I scrambled in my handbag for a pencil and a receipt to jot down a thought. I stepped in a large department store and was whacked by something to add to my manuscript and again, scrambled for the paper and pencil. (I really should learn to use my phone. Lol.) I’ve sent myself emails. I have a stack of sticky notes on my desk by my computer of ideas to add to my book. By doing these things, is my work fresher? I believe so. And since I like how I “pants,” I doubt I’ll change my writing style. It may be slow, but it does get the best from me. Speaking of discovery—have you discovered my books? 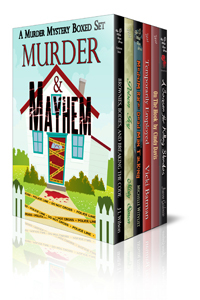 Try this cool boxed set, Murder & Mayhem, which features my humorous romantic mystery, Temporarily Employed, as well as others. Happy Reading! Bring on the Holidays! Food. Movies. Books. Thanksgiving is right around the corner and for my family, this day marks the kick-off of the holiday season. Tons of parties with good food. Snacks to curl up on the couch with and munch on while watching a sentimental holiday flick. All pretty standard fare – right? No? You mean Stalag 17 is a war movie? LOL. Well, it is. But it takes place on Christmas Eve and there are lots of Christmas references in it with a great resolution in the end. Having boys, by incorporating this one, the romantic and silly ones are easier to take. Noel Noel Noel by Merry Holly ~ Dumped and lonely, is it possible to find love at the local mall? Noelle thinks not, but a chance encounter with Chase Clayborne while Christmas shopping has her rethinking her rigid set of rules. A Cinderella Christmas by Cara Marsi ~ Jessica Gallo no longer believed in fairy tales or happy endings. And she certainly didn’t believe she’d find her Prince Charming at Saks Fifth Avenue. Her Fairy Godmother thought differently. Matchmaker Matchmaker by Bobbi Lerman ~ With Chanukah around the corner, is there enough magic left for a matchmaker to bring Molly’s cynical heart back to life? Yuletide Bride by Gerri Brousseau ~ The Dowager Duchess’s decree that her grandson must marry before Twelfth Night or relinquish his title and fortune sends him into a tail spin. Without any prospects and with only two weeks until Christmas will Stuart Nelson find himself destitute or will he find The Yuletide Bride? Holiday Disaster by Vicki Batman: The week before Christmas and all is in disarray when a librarian experiences horrible plumbing issues and a Mr. Maintenance Man who isn’t nearly as jolly as Santa Claus.